In this case, I got out of the routine of reading Christian author John Shore’s blog over the holidays returning to discover I’d missed all the excitement — he’s launched a major movement. Okay, major in the sense that while it only has 300 members as of Saturday, it has the potential to shake things up a bit. Or a lot. We are Christians who find conservative/right-wing Christianity too oppressive and exclusionary, and progressive/liberal Christianity too theologically tenuous. We embrace both the conservative Christian’s belief in and fidelity to the core message of the Gospels, and the liberal Christian’s dedication to inclusiveness and social justice. Rather than continuing to choose between these two roads, we hereby establish the following, which we recognize and affirm as a thruway running between them. There then follows a 16-part statement which touches on some current issues dividing the two camps, a manifesto that really comes alive in a 16-part “teen” edition also presented. “The ThruWay Christians” may sound like an excellent title for a B-movie. Several decades ago, some people we knew despaired over the lack of crossover potential in the term ‘Contemporary Christian Music,’ and sought an alternative to describe music that causes you to reflect on the greater issues of life, coming up with… “Reflecto Music.” Seriously. Okay; having got that out my system, let me state some reasons why I think there is some need for some middle ground; reasons why I think John and company may be on to something. 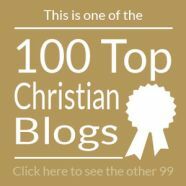 A couple of the recent blog posts at JohnShore.com have happened because of correspondence from Christians who are also identify as LGBT. (The short form for “L or G or B or T,” in case you’re wondering.) Now I know for some, the idea of LGBT Christians is an oxymoron like “jumbo shrimp,” or “honest politician.” But if you dig a little deeper, you’ll discover people whose desire to follow Jesus is real while at the same time, their sexual identity is different from yours. Or mine. That’s not the point here, and I’m not going to go down the comment trail on that issue. What is the point is that some individuals’ felt needs are not being met by the church (local) or The Church (universal). Which, I will admit, probably suits some people just fine. That’s because Christianity in the U.S., where John Shore lives, is becoming like politics in the U.S.: extremely polarized. Issues that are black-and-white. Attitudes that are us-versus-them. Faith without mystery. It doesn’t suit me. I’m not sure how obtainable the goal of inclusiveness is in the light of scripture that seems to speak strongly to certain issues, but I am impressed with the idea I took away from reading the W. P. Campbell book I reviewed here on Thursday; the idea that the “extremes” currently visible can be best expressed as “Grace with compromised truth” and “Truth with compromised grace.” There is a need for middle ground. A need for a highway (as we Canucks call it), a dual-carriageway (as the Brits say) or a thruway (as the Yanks say) running through the middle. And so, first John had the ThruWay Christians Facebook Group. Publishing the document for ThruWay Christians threatened me. It was not to my personal advantage to do that. It wasn’t ambitious of me. It was the exact opposite. That was me nearly committing career suicide. I think there’s something of value here. I think we should all be listening. Phil Johnson wonders what Mosaic teaching pastor Erwin McManus is thinking with his production of “Casket” — wherein a guy stages his own funeral — as the play appears, in Phil’s opinion, relatively devoid of anything close to a proclamation of the gospel. Read the piece and its comments at Pyromaniacs. All the money being donated for Haiti is being ‘parked’ in a contingency account for the next emergency? That’s the suggestion of an anonymous disaster relief worker at this “Stop Donating!” post on the blog Solar Crash. Tony Campolo explains why he’d like to add “Do You Hear The People Sing?” from Les Mis and “The Impossible Dream” from The Man of La Mancha to the repertoire of your church’s worship team (!) 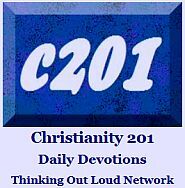 at this interview on Christians and the Arts at the blog The Virtual Pew Daily. Randy Alcorn re-examines the notion that our charitable giving should always be done in secret. Yes, he knows that it was Jesus that suggested that, but he offers a fresh look at that passage, and a few others at Eternal Perspective Ministries. Ever feel like you’re invisible? Jeff Leake embedded this six-minute YouTube video featuring Nicole Johnson, which he says he also used at last weekend’s services at his church. Check out his blog, The Launch Pad. Darryl Dash doesn’t think it was intentional, but somewhere along the line, the “invocation” or “call to worship” which once started most Evangelical worship services, became the “welcome,” which isn’t really the same thing. Check out this short but important post at DashHouse. The Post is titled, “How Much Weight Do We Grant To Experience?” though a better, albeit somewhat longer title might be, “What are the Advantages of Aligning Oneself with Groups That Have Frequently Encountered Opposition?” Okay, maybe the short title works just as well. This interesting topic over at Pastor Matt‘s blog is begging for more of you to jump in. Andrew Jones aka Tall Skinny Kiwi summons all the courage he has to go inside a… wait for it … Christian bookstore. Apparently these places frighten him. Read part one of the hair-raising account. David Fitch suggests that if the church you’re visiting next Sunday is truly missional, there are eight things you should notice right away. Actually, we think these eight things should be present regardless of other considerations. Check it out at Reclaiming The Mission. Excellent article. Reformed blogger Kevin DeYoung suggests that if we’re going to toss around the phrase “social justice” we would do well to define it first. Read his “Modest Proposal” at DeYoung, Restless and Reformed. This one takes us back to December 21st (that’s light years ago in blogging terms) and a refreshing list of “redefinitions” of commonly used religious terms at the blog Kingdom Grace. Pastor Mark Driscoll approaches the 14-year anniversary of Mars Hill Seattle with some things he would do differently he could. Not enough links here? 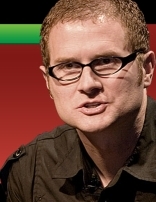 How about a list of the Top 55 Pastor Bloggers. That’s what it’s called. 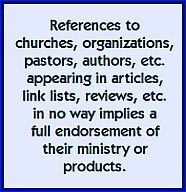 Some of them are really links for pastors. Check it out at the Online Christian Colleges site. Our cartoons this week are from A Time to Laugh drawn by Aussie comic artist John Cook.